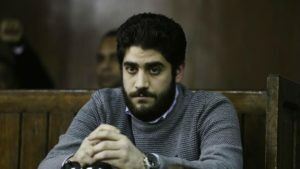 One of the sons of former and imprisoned Egyptian President Mohamed Morsi was released Wednesday on bail after security forces detained him briefly for spreading false information in an interview he gave to Associated Press (AP) last week. The 23-year-old Abdullah Morsi, according to a judicial source, was freed Wednesday after paying $280 in bailout. He was arrested at the family villa on the outskirts of Cairo early in the morning. Security forces broke into the house on the lookout for him over the dissemination of “false news” in connection with an interview with AP on his father’s detention. Mohamed Morsi, toppled in 2013 by incumbent leader AbdelFattah al-Sisi, has been sentenced to 25 years for spying for Qatar. Another court ruling pressed 20 years in prison against him for the killing of protesters during demonstrations in 2012. Abdullah, the youngest of the former leader’s five children was convicted in 2014 on charges of drug possession, and sentenced to one year in prison, a sentence that he had already served. Osama, another son, is currently in prison and is facing a 10-year prison sentence following a court ruling last month for participating in protest against his father’s overthrow. Osama, Reuters reports, has planned to appeal against the court verdict. Posted by KanelkaTagba on Oct 11 2018. Filed under Headlines, World News. You can follow any responses to this entry through the RSS 2.0. Both comments and pings are currently closed.